Celebrated among couples, families and solo travellers, Hermes Hotel is a relaxed property that offers half-board and bed & breakfast accommodations. 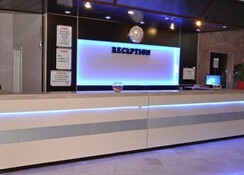 This is a lively hotel that offers amicable Turkish hospitality and impeccable service. Hermes Hotel features 77 beautiful standard rooms that are either furnished with twin beds or double bed. These accommodations are simple in designed, finished with light shades and colours—the furnished balconies overlook the mountains, pool area and the neighbourhood. You will find air conditioning, private bathroom with amenities, TV with satellite, hairdryer, phone, WiFi internet and safe deposit box across the rooms in the hotel. Rooms are cleaned every day and fresh towels and linens are provided daily—do approach the front desk for extra bed, crib and other additional facilities and services. The hotel houses a restaurant that serves continental breakfast in buffet style—on the spread you will find plenty of hot and cold items, freshly baked and prepared by the chefs. And at lunch and dinner, the restaurant serves lunch and dinner in international style. The assortment includes both local and international cuisines that are carefully prepared by the chefs—in the evening you will find theme dinners that are weekly organised. The poolside bar serves scrumptious light meals and snacks during lunch hour and in the evenings—a series of alcoholic and non-alcoholic drinks are also available. And in the evening, the main bar comes to live with an extensive alcohol menu with numerous lively events, dances and entertainments. The hotel houses a large outdoor swimming pool that comes fitted with loungers and parasols—do approach the front desk for lilos and beach towels. The animation team organises various water games such as aqua aerobic, water gymnasium, water polo and water volleyball. In the evening the hotel organises karaoke, cultural shows, games, and other lively and entertaining events suitable for all guests. You can also play billiards, darts, table tennis, or visit the library, or enjoy the regular BBQ parties at lunch. There is a separate paddle pool for kids and a playground in the backyard. Otherwise you can visit the beach where you can try various water sports activities such as wind surfing, water skiing, scuba diving, snorkelling, fishing and more. 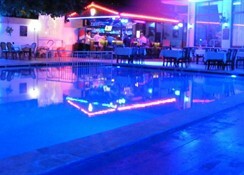 Located in Armutalan (Marmaris), Hermes Hotel is a lovely two-star property. The hotel is about two kilometres away from the vast sandy beach where you will find scores of motorised and non-motorised water sports activities. There are various restaurants, bars and clubs around the hotel, but for more options you have to visit the city centre, which is about 3 km from the hotel. Few places of interest that are close to the hotel are Aqua Dream Waterpark (1.8 km), Atlantis Waterpark (1.9 km), and Marmaris Youth Square (4 km). This is mainly a town where you soak and bask on the sun the whole day and have gala parties at night. However, you can consider visiting some seaside towns and villages, such as Icmeler, Turunc, and Bildibi, ideal for a day trip. The harbour is roughly 3 km from the hotel, and distance to the airport is Dalaman Airport is 96 km.